National Junior Ranger Day is right around the corner. 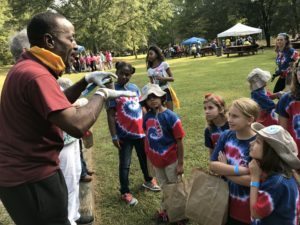 A panoply of programs at National Park affiliates across the country – including your Arabia Mountain National Heritage Area (AMNHA) – the Junior Ranger program provides an entryway into the wonders of the park system and the outdoors. At any time of year, kids can pick up a Junior Ranger booklet from various sites within the AMNHA and complete a series of activities to earn their badge. National Junior Ranger Day brings the discovery of the entire Junior Ranger Program into a single day, with kids experiencing activities like gardening, necklace-making, fishing and hiking. 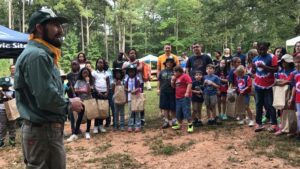 This year’s Junior Ranger Ramble, on April 20th, will take place at the Davidson-Arabia Mountain Nature Preserve (3787 Klondike Road). Activities will be scattered across the Nature Preserve, with rangers leading groups of kids from one station to the next as the day goes on. The event will culminate with a group swearing in and hike to the top of Arabia Mountain. 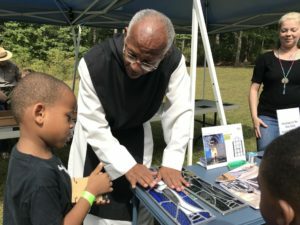 This year’s partners include the Arabia Mountain Heritage Area Alliance, the Atlanta Wild Animal Rescue Effort, the Davidson-Arabia Mountain Nature Preserve, the Flat Rock Archives, Monarchs Across Georgia and the Monastery of the Holy Spirit. Representing every corner of the AMNHA, this exciting group of partners will guide kids through the rich natural, historical and cultural legacy of this place, right at the base of one of the area’s iconic monadnocks. 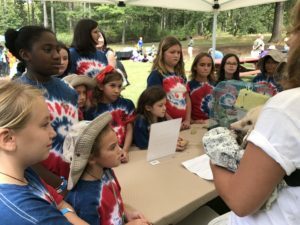 “I love the Junior Ranger program because it lets kids experience this incredible resource right in their backyards,” said Sarah Lisle, Director of Interpretation for the Arabia Mountain Heritage Area Alliance. 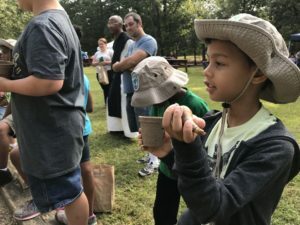 “From iconic historic sites to the peace of the Monastery to the rich beauty of this area’s greenspace, there is so much to explore.” Beginning north of Lithonia and extending south of Conyers, the AMNHA encompasses over 400 million years of natural and human history. Including historic sites, resilient communities and beautiful natural areas, this National Heritage Area provides a gateway to the Georgia Piedmont region across time. Kids and parents can join the Junior Ranger Ramble for an introduction to this rich and fascinating landscape. Join us on Saturday, April 10th for a day of outdoor discovery and fun. Tickets are $5 for kids (free for adults) and can be purchased here. For group ticket rates, contact Sarah Lisle at (404) 998-8384 ext. 6. 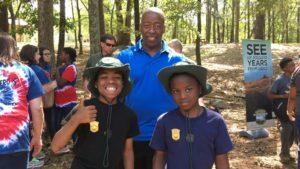 Once you’ve become a Junior Ranger at the AMNHA, you can continue the Junior Ranger fun at other National Park affiliates in the area, including at Martin Luther King, Jr. National Historical Park, Kennesaw Mountain National Battlefield Park and the Chattahoochee River National Recreation Area. Check out these local parks for more information. You can also head over to the National Park Service website to earn some Junior Ranger badges at home! Come find your park with Junior Ranger.